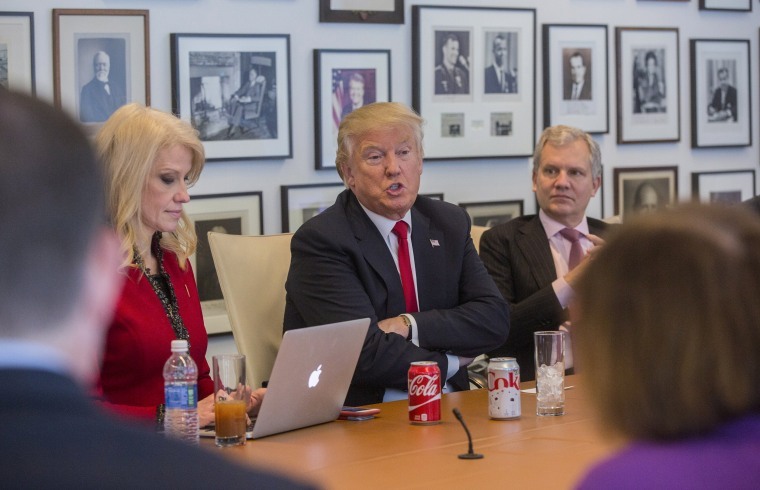 Trump reportedly sips a dozen Diet Cokes a day. His own tariffs mean that habit is about to cost him just a little bit more money. Have a Coke and a… frown? President Donald Trump and millions of others are about to find that their soft drink of choice is going to become a little more expensive — thanks in part to the commander in chief's tariffs. Coca-Cola CEO James Quincey announced this week that rising costs were driving an unusual mid-year need to raise prices to consumers. The reason is "the freight, the metals, the steel, the aluminum going up, the labor going up," he said during a CNBC interview. He directly mentioned tariffs to the Wall Street Journal. It wasn't long ago — March, in fact — that Commerce Secretary Wilbur Ross predicted no major impact on consumers from steel and aluminum tariffs. Ross held up a can of Coke while defending the use of tariffs. "Here's a can of Coca-Cola," Ross said. "Coca-Cola has three cents of aluminum in it. If that goes up 10 percent, that's three-tenths of a percent. I just paid $1.49 for this can of Coke. It doesn't mean anything. So all this hysteria has a lot to do about nothing." He did something similar at the time with a can of Campbell's Chicken Noodle Soup, noting that a 25 percent tariff on steel would add just six-tenths of a cent in cost. In a May earnings call, a Campbell executive blamed steel tariffs for problems with future profitability. And now it's Coke, correcting the record. While the cost increase of one single can may seem negligible, it adds up over the tremendous volume a company like Coca-Cola sees. Looking at the malted beverage sector, according to the Beer Institute, more than 5,000 active breweries in the U.S. last year bought 36 billion aluminum cans and bottles, with the aluminum being the largest single input cost for the can. "I wonder if that's the case with a can of Coke?" said Jeff Inman, professor of marketing and business administration at the University of Pittsburgh, to NBC News. "If I was Coke, I'd say that information out there about aluminum being a fraction of the price of a can is false. It's, boom, some number. On top of that we're experiencing increased fuel costs. Those are all plausible justifications." However, it's impossible to tell from the outside how much the company's costs are increasing. "This will allow the drink companies to lock in additional profits for the foreseeable future without the usual incremental price increases," said Robin Lee Allen, managing partner for private equity firm Esperance. Not that the company is hurting. In its second quarter earnings announcement, Coca-Cola said that unit case volume was up 2 percent, year over year, with Coca-Cola brand beverages leading the increase. Earnings per share were up 68 percent. The Twitterverse, meanwhile, had its own opinions on the impact of Trump's tariffs, with many noting that the fast food-loving president seemed to be inadvertently supporting a shift in public health policy by making sugary sodas more expensive. Trump wins again!! Less Coke consumption, the healthier America will be. President Trump= Making America Healthy again!! MAGA!!! !